Trying to figure out where to place your tree blind for deer hunting can be an arduous process. You can’t exactly move the tree stand with ease when you have put it up, and deer hunting is extremely difficult. There are a few key factors which you need to consider where you are going to put it, and choosing between tree blinds vs ground blinds adds yet more difficulty to the process. The best placement for your tree blind or ground blind depends on the terrain which surrounds your hunting are and, of course, what you are hunting with and its shot distance. Before you decide where to place your tree blind or ground blind, you need to take into consideration a few key variables. #1: Are You in a Woodland Area? When you are hunting in a woodland environment, proper placement of your tree blind is crucial for the overall success of your hunt. In a heavy woodland environment, visibility is limited at best and you are adjacent to various obstacles which make aiming and clearing your shot difficult. It is important to place your tree blind where you will have the best chance of a clear and successful shot, whilst remaining hidden and out of sight from any deer which are perusing through the area. The point of a tree stand is to keep you out of the deer’s line of sight and to remove the scent trail, however, you cannot just pick any tree and throw it up – take time to learn the deer’s travel patterns and study them carefully. The major negative to hunting in a field is all the open space. Although the visibility is better, and you can see the deer easily, the same goes for them too – they will be able to see you easier and thus making the hunt harder. You can set up your ground blind anywhere in a field to hinder the deer’s vision and throw them off the scent, but the higher up you can get the better. Elevated ground blinds are great for deer hunting, but keep in mind that they will be able to see the ground box easier if it is in an elevated position. It is always better to use the natural setting for cover when hunting deer – such as haybales – so use these if available. It is down to you to determine which method – tree or ground blind – works best for you, and where you use them. You can quite easily use a ground blind in a woodland area if you find that it works for you. There are many variables which you need to consider when deciding which sort of blind to use, and where, and the longer you take to monitor and study your hunting area, the more long-term success you will have. Hunting deer is a time consuming and delicate process. Deer are very timid and switched-on animals which will flee at the first sign that something is not right, this includes an out of place tree blind or an off-scent. 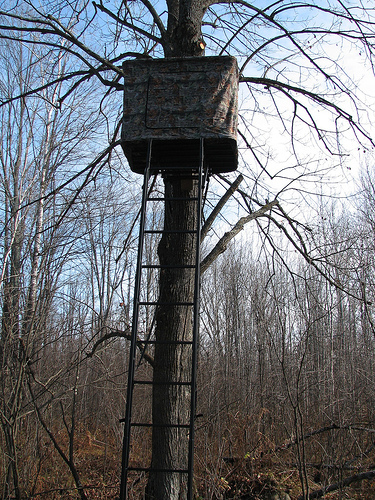 For these reasons, proper placement of your tree or ground blind(s) is crucial and is something you should put a lot of time and research into deciding on.